On a dusty drive down rural Punjab last month, I see farmers rushing out to fields with their harvesting equipment, kicking dirt and cutting wheat, one field at a time. 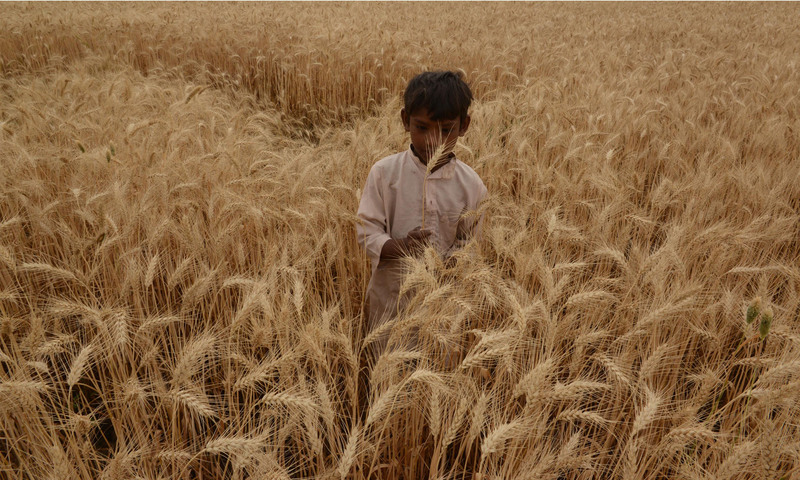 Annual wheat harvesting in Pakistan starts in April, beginning in the southern parts of the country and moving geographically upwards along rising temperatures. It culminates in the mountainous north before the start of the monsoon rains. The change in temperature – from cold to pleasant to hot – at the right time is essential for the ripening of the wheat crop. Too much rain can be dangerous because wheat is highly sensitive to moisture. When the weather is suitable, wheat stalk grows quickly — sprouting the grain-rich spikes and turning to a rich golden yellow all in a matter of less than a month. 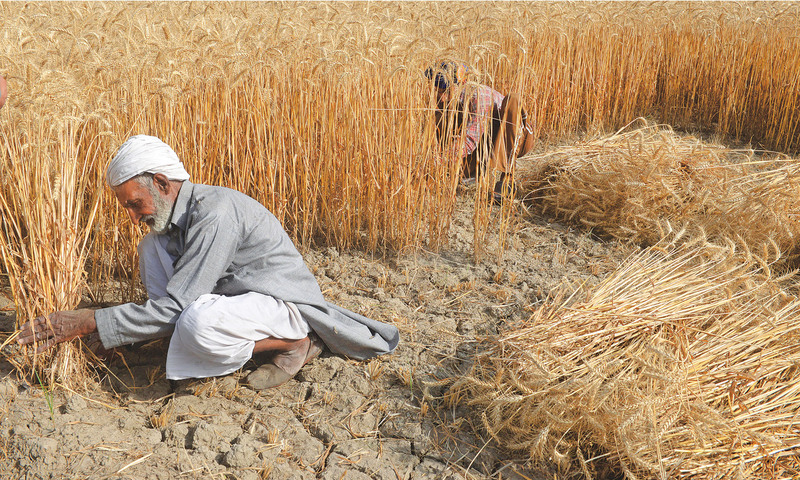 Luckily for wheat growers in most parts of central Punjab this year, the field temperature averaged 35 degrees Celsius (exceptionally hot for April). It was just right, as was the rain this year, for wheat harvest. The crop, in fact, ripened earlier than usual this year, ready for reaping at least a week ahead of its normal season. At a small farm near Changa Manga, a few kilometres south of Lahore, a family welcomes me to their wheat field. In one corner, they have spread a patchwork quilt for collecting wheat that is being threshed by a machine working nearby. An old woman concocts tea on a makeshift stove of bricks. As we stir our tea in small cups and sit back on the edge of a squeaky charpoy, we discuss how crop cultivation and harvesting have evolved over the decades. The old woman recalls how, a few decades ago, it took two to three days of intense manual labour with sickles to reap just one acre of wheat — and that too after a few men worked together from dawn to dusk. Mechanical separation of grain and chaff was unheard of; intensive stomping by bullocks moving in ceaseless circles was employed to soften the harvested spikes dried carefully in the sun to perfection. The softened spikes were then tossed in the air with wooden implements that resembled large forks, to let the wind separate grain from chaff. If rain came while the spikes were spread out in the field for drying or for stomping, the whole crop would be endangered. If there was no wind, no separation of grain and chaff would be possible. Delays were common as was the likelihood of an entire crop getting destroyed due to inclement weather. Harvesting has become extremely easy and quick with technological advancements, she says. 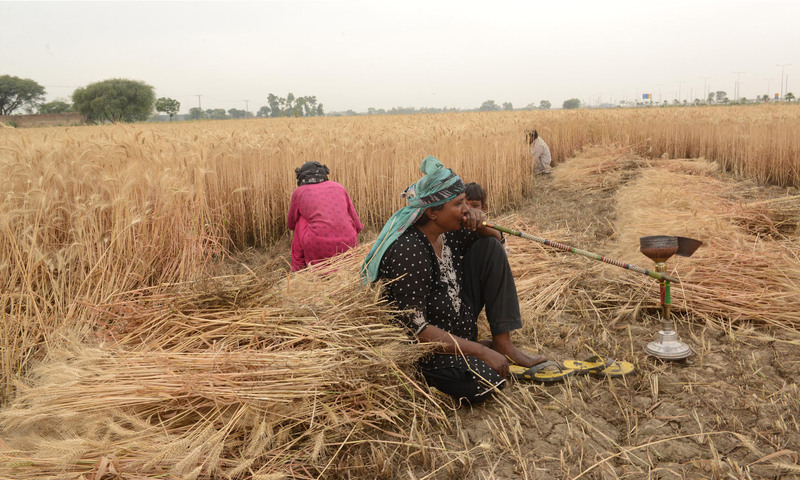 Automation has ensured safer and efficient harvesting, but it has also put an end to the carnival of collectivity that reaping of wheat has been for centuries in central Punjab. It was a communal endeavour; everyone helped everyone in the harvesting process, from the cutting of the crop to its threshing and transportation to granaries. And it culminated in the celebration of the Baisakhi festival, which was essentially a thanksgiving occasion for a successful harvest. The woman in Changa Manga misses all that festivity, with its fairs, public dancing, singing, dhol beating and competitions of traditional sports such as kabaddi. Farmers would guard their harvested crop at night, sing songs and roam the farmland with gaiety, she says. Now it has all become a robotic commercial activity. Wheat harvesting is traditionally done in three stages: cutting, binding and threshing/winnowing. In many parts of central Punjab, cutting is done with tractor-mounted reapers, but binding still remains a manual process. Bundles of wheat are also manually passed through a machine run with the help of a tractor to thresh and winnow. Well-to-do farmers and those owning large tracts of farmland employ combine harvesters that do all three processes simultaneously, and without much help from human beings. A few miles away from Okara, I meet four people armed with sickles. The woman among them does not want to talk to me and disappears for a water break. I ask one of them how much each of them gets paid for cutting the crop. 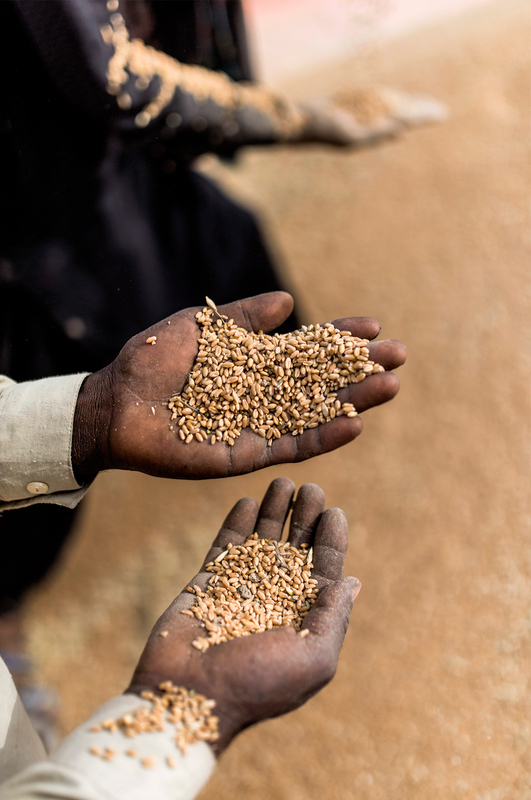 They say they receive their wages in kind: 120 kilogrammes of wheat for reaping one acre. This takes them two to three days if they work five to six hours a day. Muhammad Ashfaq manages a relatively modern farm near Raiwind, a semi-urban area a few kilometres to the south-east of Lahore. As I discuss changes in the wheat harvesting process with him, a combine harvester ferociously sweeps the crop into its storage drum. A combine harvester takes only one hour to process an acre of wheat, but it charges 2,500 rupees for it. To be paid in cash — this is not the kind of money many in the agriculture sector have. A combine harvester also destroys the wheat stalk that – when reaped manually and processed through threshing machines – is used as fodder for livestock during the months when green grass is not sufficiently available. 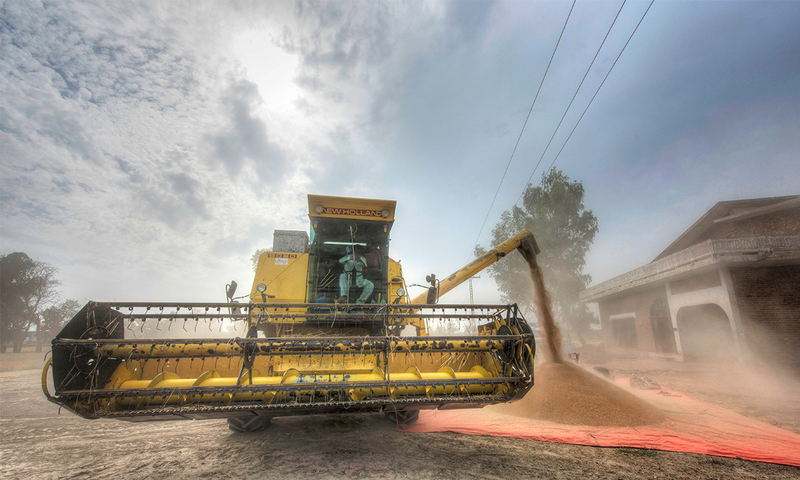 Though the first combine harvesters were developed in the United States in the early 1900s, they only started appearing in Pakistan in the 1990s. Now they are easily available on rent. Wheat fields are a combine harvester’s battlefield. I watch how it races out to the ends of the field as in animosity, ingesting big swathes of the crop with each rotation of its reaper. The machine starts at the edges of the field and moves towards the centre in gradually narrowing circles. As soon as its 4,400 kilogramme storage capacity reaches its limit, the driver empties its contents onto a polythene sheet. The harvesting process is not completely automated yet. Once the harvester empties itself and returns to cut other fields, men scurry to the dumped wheat to filter sand out of it. It will need to be cleaned before being used. The labourers then put the grain in gunny bags before loading it onto transport trucks. A large part of the harvested wheat ends up with the provincial government’s food department after it is collected at official procurement centres. 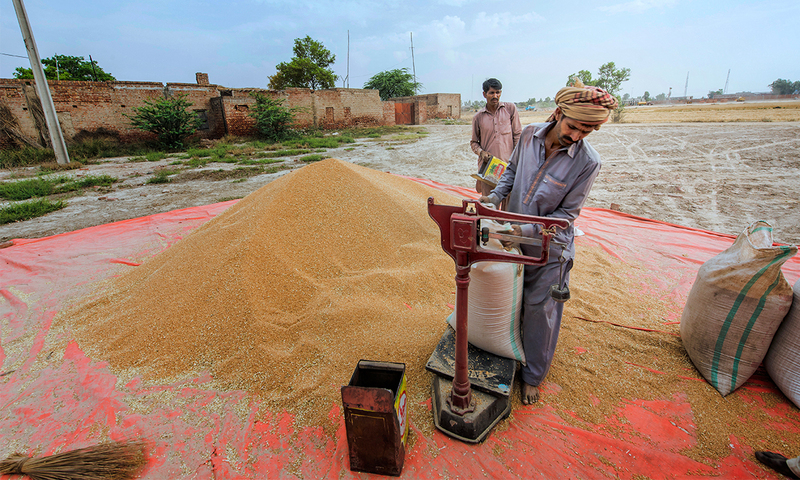 This year, the Punjab government has planned to procure four million metric tonnes of wheat from farmers across the province via 376 procurement centres. The government has also set a minimum price of 1,300 rupees per 40-kilogrammes as the price for the crop. Hundreds of thousands of private buyers are also prowling the farmlands. Ashfaq’s fields are right across the road from Bahria Orchard, a posh housing project on the ever-expanding outskirts of Lahore. He says he is going to sell his land to a residential scheme after harvesting the crop — like many other farmers are doing in the area. This has led many agriculturists and planners to worry about the shrinking of the agricultural land in central Punjab, especially in towns and villages next to big cities. As I watch the frantic construction activity taking place across the road from his wheat crop, I wonder what the fields will look like next year this time round. There will be, of course, no wheat here. This was originally published in the Herald’s May 2016 issue. To read more subscribe to the Herald in print.